A delicate Chantilly lace teeming with floral emblems is the perfect textile for style BL242 Cobalt. 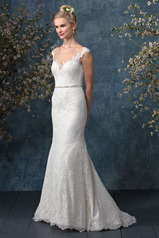 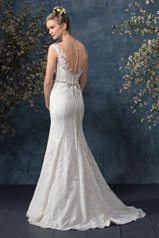 A bride's face will be framed beautifully by the illusion bateau neckline, while the dainty cap sleeves and semi-cathedral length train are other notable aspects of this gown. 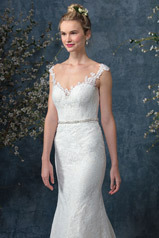 For the woman who prefers just a touch of sparkle, the detachable beaded sash is a welcome addition.